Hello, my dear stamping friends, Irit is here again with some scrapbooking inspiration! 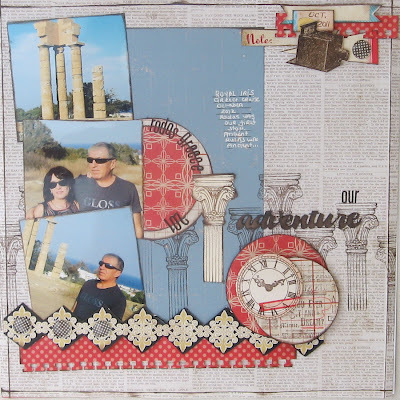 For all of you "Stampers" out there that are also "Scrappers" I hope this will inspire and encourage you to think about using those stamps that you have and love on your scrapbooking pages too! 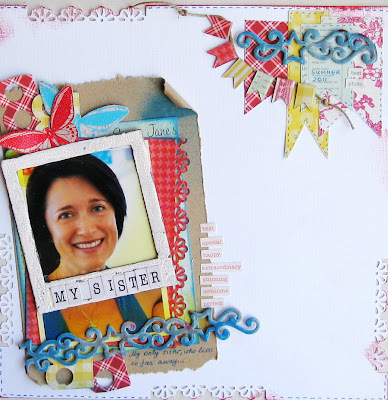 Today I have 3 more layouts to share with you all using The Rubber Cafe' stamps to create my embellishments. I added two stamped and heat embossed butterflies using the stamp set Vintage Treasures and place them just over her photo. I finished it up with some more paper and chipboard embellishments and that's it! 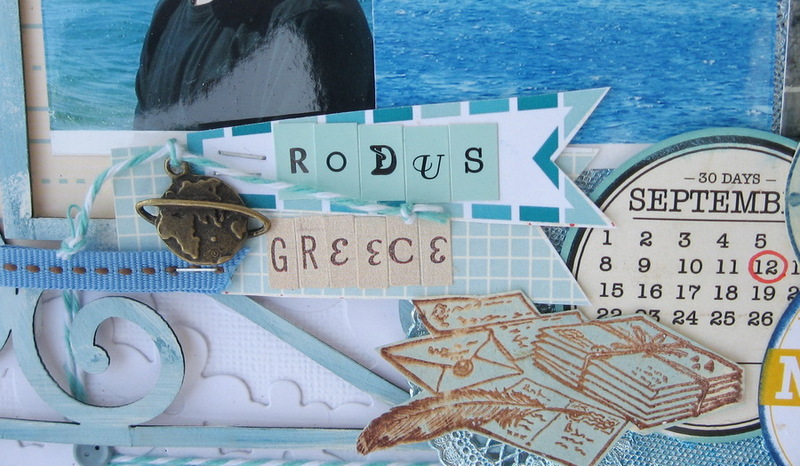 For my second layout today, I am once again using our Greece vacation as my inspiration. Here I've used the Letters and Compass stamps as my embellishments. 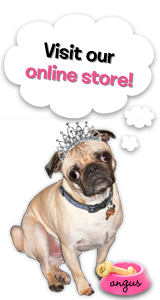 Both pages were published in Scrapbooking News and Review Web magazine April/May 2012 issue. For my final page today I have another travel layout (we travel a lot and I just need to scrap those memories!) This layout is "Our Adventure". I just received the Column stamp and thought it would be perfect for these photos. The 3d Column in the middle was a stamping mistake. 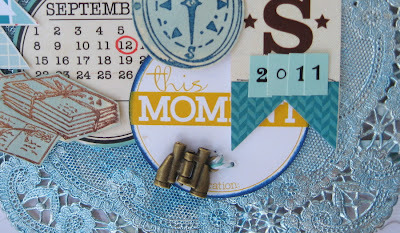 It's very easy to cover your stamping mistakes with the same stamped image. I stamped and cut another column and popped up with dimensional foam adhesive. Other stamps used here are the "Clock" and Newspaper print" from the Vintage Treasures set I also used the "Lines" for journaling from Basic Backgrounds 2 stamp. Finally I stamped and heat embossed the "Camera" also from the Vintage Treasures set which finished the embellishment cluster I placed in the upper right hand corner of my layout. 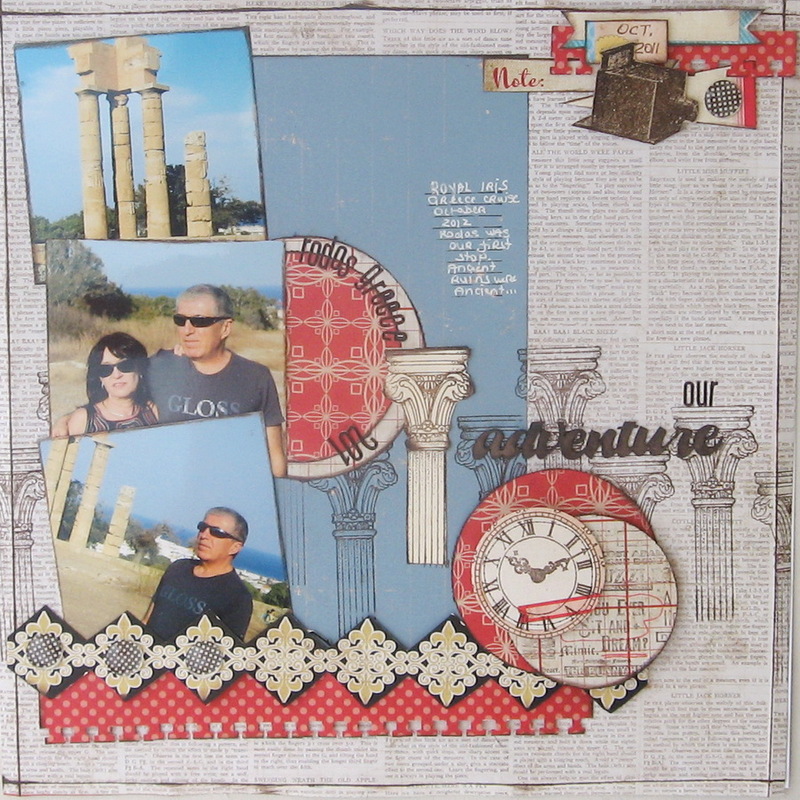 I hope you enjoyed and were inspired by my scrapbook layouts for this month! I'll see you next time with more Rubber Cafe projects. 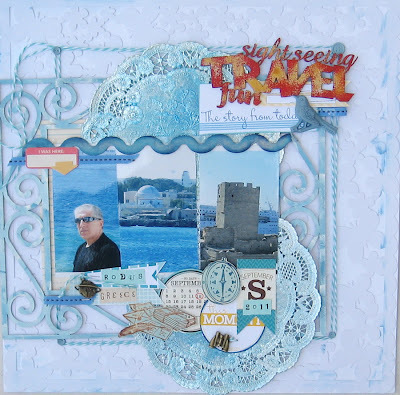 Beautiful layouts Irit! Don't you just love all the depth and interest stamps can give to your pages? I envy you and all your exotic travels.